Having secured what I knew to be the last available ticket for Yohangza Theatre Company’s production of Hamlet, I was surprised to find myself sitting next to the South Australian Premier and his wife for the performance. The irony of watching a king’s downfall orchestrated through a theatre production while sitting next to the leader of a state government in a theatre was not lost on me, but I doubt that Mike Rann and his wife felt the same pangs of guilt as Gertrude and Claudius. Played by Eun-Hee Kim, this Gertrude is perhaps not as guilt-ridden as some I have encountered. But whereas Gertrude is often portrayed with an underlying sense of her own moral corruption, Kim has given her an aloofness, lasting until Hamlet finally reveals his hand following the theatre scene. I prefer this change, as risky as it might be. It holds more weight with Shakespeare’s text, and in this production, in this context, it provides a profound shift in the character that is necessary to add depth for its Australian audience. This is not a criticism of the performers, but a play performed in Korean for a predominantly English-speaking audience can’t skimp on such details. Hamlet certainly doesn’t. Played by Jung-Yong Jeon, his vacillations are as palpable as that fatal hit, and his descent into madness is beautifully paced; almost undetectable. Claudius could perhaps have emoted rather more; by both dress and demeanour he emerged more western than the rest of the cast. But in all, this cast expended enough energy and elicited enough pathos to warrant a standing ovation from the opening night audience (though the premier, notably, remained seated). A minimalist set spares no effort, with a centre rostrum raised in the middle of what must be hundreds of kilos of rice, and surrounded by traditional Korean artworks, and Korean percussive instruments. These instruments are put to excellent use by the cast, whose timing and energy is perfectly synthesised. 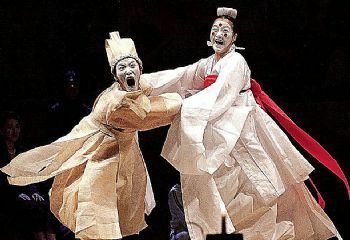 More intriguingly, Korean Shaman rites are used to ensure the story is at home in its Korean context. This is a remarkably sensitive production of what I think is Shakespeare’s greatest work. It is faithful, if such a word can really be applied to any production of Shakespeare’s work later than the seventeenth century, to the characters, their motivations, fears and desires; as well as their circumstances. And it dispels in my mind any doubt that the stories of Shakespeare are absolutely universal in their application to humanity.